I am brewing a pumpkin ale this weekend. Pumpkin ales are not my favorite, so why am I brewing one? The main reason is that the SheppyBrew Beer Model really likes them, and (let's face it), it is a good idea to keep the Beer Model happy. Plus, a pumpkin beer is something that I've never brewed before, and it is fun to try new things. Actually, it is really more surprising that this is the first time I've attempted to brew a pumpkin beer. You can take a look at my recipe on the SheppyBrew website: Will-o'-Wisp Pumpkin Ale. It came up at work today that I will be brewing a pumpkin ale. The guy I was talking to asked me, "what is a pumpkin ale?" I was a bit taken back by that question. Sometimes I forget that most people are not nearly as beer-nerdy as I am. Most people's sense of beer types are "domestic", "imported", and "micro-brew". I guess pumpkin is not something lots of people think of as a beer ingredient. The answer to "what is a pumpkin ale? ", seems obvious, doesn't it? A pumpkin ale is an ale brewed with pumpkin as one of the ingredients. Obviously. Right? It actually is not really that simple. Believe-it-or-not, there are pumpkin beers that don't contain pumpkin. I know this mostly from home-brew forums and books. I don't know of any commercial beers that call themselves pumpkin beers without actually putting some pumpkin in the beer. I do know it happens on the home-brew level, though. I assume that there must be some commercial brewer somewhere who also does it too. The main non-beer flavor usually associated with pumpkin beers is pumpkin pie spice. Most brewers will add pumpkin to their pumpkin beers mostly so that they can say the beer actually has pumpkin in it, but pumpkin itself doesn't impart a whole lot of flavor to the beer. Or, at least that I what I have read and heard. 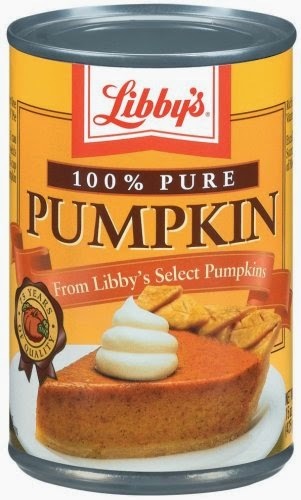 My beer, Will-o'-Wisp Pumpkin Ale, will in fact, have 100% Pure Libby's Canned Pumpkin in the mash. I am planning on "roasting" it on my grill which may or may not provide a bit more pumpkin character to the beer. I know that pumpkin in the mash will contribute fermentable sugars, but I have not found definitive documentation on how much it will add, so my recipe starts with a pretty low ABV and considers anything that the pumpkin adds to be a bonus. Its really just an experiment, but I do think it will turn out acceptable to the Beer Model. The pumpkin pie spice is also a bit of a wild-card. I need to make sure I add enough that the Beer Model knows it is in there. I also need to restrain the spice enough that I don't think the beers taste too much like pumpkin pie. Off the top of my head, I do not know how much pumpkin pie spice that is. To solve this little puzzle, I am adding a little pumpkin pie spice to the beer in secondary and making a larger tincture of spice to add straight to the keg. Basically a "tincture" in this case is a solution of alcohol (vodka is probably what it will end up being) and spice. I'll add a little of the tincture, do a taste test. If it doesn't seem like enough, I'll add a little more. Repeat until I have a blend that both taste-testers can agree upon. And there you have it. SheppyBrew's Will-o'-Wisp Pumpkin Ale. Leave a comment below if you have questions or concerns or just want to say "hi". I'll be sure to let you know how my Pumpkin Ale turns out.